When you think of women in the Bible, who comes to mind? Probably Mary. Maybe Esther. Possibly Ruth. What if I asked you about Gomer? Would you think adulteress? Prostitute? When I think of Gomer, I think of the woman in the mirror. I see myself in her failures and brokenness and I am reminded of how scandalous the love of Christ truly is. 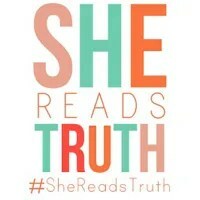 I would be honored if you would join me at She Reads Truth, today. Thank you for today’s devo, Stacy! It was a huge blessing!